In the last couple of days there has been some quick unexpected improvements in Glade, Javier Jardón wrote us up a brand new website ! So with the help of Rafael Villar Burke (Pachi), we touched up and finalized the content and translated it into python scripts so it can be easily updated with news items in the future. Well, incase you’ve been wondering what the hell happened to me, I am alive and well – finally I am unemployed – hoping I wont have to use the software hobby alter-ego as a crutch again anytime soon… man I am free can you believe it ? So, with this newfound freedom I decided to aimlessly tread the earth, I am now in the beautiful huge crazy city of Sao Paolo in Brazil, comming from montreal canada thats quite a long shot (10 hrs one the plane ! ), the weather is a little dreary at the moment but promises well, the people are very hospitable and the women beautiful and abundant, oh and this great hostel that I highly recommend is sporting an Ubuntu system for its guests, wow ! Glade is due for a tarball soon, I guess I’ll roll one as soon there are a couple more fixes, I guess it goes without saying that I wont be actively hacking for at least a couple of months, but thanks to hostels in south america running solid ubuntu systems I’m still reachable in the virtual tube of your desktop. Hey hey, long time no blog, my hacker alter-ego takes the back seat as much as possible but sometimes I have to pop out of the woodworks and say BOO ! As you all know from Johan’s recent post the infamous builder is on the rise, this means people will be desiring UI designers to produce UI description files that can be interpreted by the builder. So on that note, I wish you all plenty of sunshine, tequila, hot babes on the beach & booming beats to dance to… if you’re not all that lucky, you can always put on your hacker alter-ego and hack away on gnome ! So, here’s a question I’d like to put to all you hackers out there that do all the great things that I think gnome is, gnome and the free software movement in general is something that has tought me alot about communicating and compromising with people and I think its important first to take into account some of the positive things about computing in general before I go and question it… I guess I only feel that way because I’ve invested a small handfull of the limited years of my life into computing and I dont believe in regrets – so there must be something or some reason for me to have spent all that time computing. Glade: Well free software is a different story – I got into contributing to free software just because I think its a great way for people to rebel, “we the people who refuse to feed the machine will make it on our own thankyou” – these dreams of mine are unfortunately not very well recieved, many free software groups are so tightly bound to huge evil moneymaking corporations that I get the feeling the difference between open source and free software is a line that is getting more and more blurry. That doesnt mean the battle is lost, but it also doesnt mean that free software is of any more practicle use to the world then proprietary software – its just software and thus is most probably a waste of time. 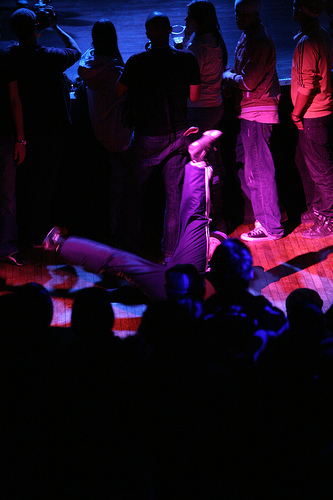 Breakdance: I know I’m a pure bboy through and through because I do it purely for the love of the art – this gives me meaning in life because I can teach by example, I express myself and through my own expressions I can show people thier own true potential through myself – standing up for your own beliefs and not being scared to express them is of the highest personal value – this is the sole responsability that comes with being human; one man cant change the whole world but at least he can express his beliefs… even if it costs him his livelyhood or “prestigous reputations”. How about the desktop PC ? what is the desktop doing to stop global warming ? not to mention video games – i.e. the successor of what used to be the child’s imagination, what will become of our next generation as a result of our mindless obsession with these boxes hooked up to screens just plugging us into web ? (or plugging us “out of the real world”) ? I’m writing this and posting it because I’m sitting here at my workplace trying to figure out what kind of moral justifications I have for being at this job, I do indeed feel guilty for sitting here and doing absolutely nothing usefull/helpfull to the world, so what will I do ? can you convince me that there is some point to computing ? Posted on March 27, 2007 August 24, 2015 Categories General, Other7 Comments on Why compute ? I’m in fort lauderdale !!! its really really windy, its 2:40am and I’m in florida. what better time to blog ? name), brought my camera but didnt get any footage unfortunately. outside, maybe we’ll get to see some bikinis before the end of january ! A happy new year to all the freaks ! its horrid factories televisions and machines..
back home on the desolate road side again. real life, I’ll see you again soon I hope ! around the world but montreals old school crew Flowrock took it home. you guys deserve your props Flowrock !